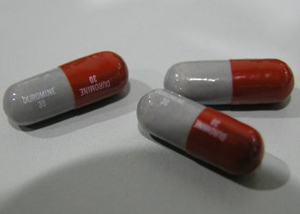 Duromine is a drug that is generally used to suppress the appetite. It is usually prescribed to people who are obese and need to lose weight. The main ingredients found in the Duromine tablets are Phentermine, Gelatin, Titanium Dioxide, Carbon Black, Iron Oxide Yellow, Lactose, Brilliant Blue FCF, Magnesium and Liquid Paraffin. There is no gluten contained in Duromine capsules. Can you take 2 of the 15mg tablets in replacement of 1 of the 30mg tablet?? ?